Have a question for Hotel Costa Del Mar? Well-placed in the beaches, nightlife, restaurants area of Playa Del Carmen city, Hotel Costa Del Mar provides a most conducive spot for you to take a break from your busy days. Situated only 0.00 Km from the city center, guests are well located to enjoy the town's attractions and activities. This modern hotel is in the vicinity of popular city attractions such as Phocea Riviera Maya, 5th Avenue (Avenida 5), Alltournative. At Hotel Costa Del Mar, every effort is made to make guests feel comfortable. To do so, the hotel provides the best in services and amenities. To name a few of the hotel's facilities, there are free Wi-Fi in all rooms, facilities for disabled guests, Wi-Fi in public areas, car park, room service. Hotel accommodations have been carefully appointed to the highest degree of comfort and convenience. In some of the rooms, guests can find internet access – wireless, private pool, internet access – wireless (complimentary), non smoking rooms, air conditioning. The hotel offers an excellent variety of recreational facilities, including private beach, outdoor pool, massage, garden, water sports (motorized). With an ideal location and facilities to match, Hotel Costa Del Mar hits the spot in many ways. If you’re a night owl, you’ll be fine. If you like to sleep before 3 AM you will be in pain. The clubs next door are really really loud. The rooms are a little dingy. The staff is nice. They have a small little slice of the beach with a bar that makes good margaritas. Bed sheet were not replaced. The bed sheet were you lay down still have sands and hair from previous occupants. Gross! Bathroom smell dried urine. Floor is dirty, if you wipe it with towel the towel will become brown. Dont even try to use the pool they have, its cloudy already. Hotel on the beach, unfortunately it was just very dirty from Seaweed that we never bathed there. Room smelled a airconditioning was very noisy, very old equipment. Without breakfast. I Never would be choose this hotel again. Nightmare till 5am every morning due to 3 or 4 night clubs next to the hotel, which were extremely noisy. Periodical cold water in bathroom. If I new, I would never book it. Location!!! Beach with beds and great staff!! Great stay!!! Fantastic location, right in the action and on the beach! Comfortable stay and friendly staff! Perfect!! Too loud at night to sleep between two night clubs. No ocean view for any room. Free wifi was spotty at best. Front desk person nonexistent. 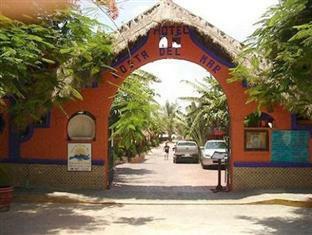 The hotel locates at the best place in playa del carmen. Staff are nice and always with a smile. You can easily access to many places in playa del carmen. However, the beach near the hotel is not good. Actually, it smells really bad. Rooms are not that comfortable and noisy outside. We stayed 3 nights. Very hip place to be. Way too loud to sleep because the bars were bumping their bass beats until 5 am. AC worked great but we had to ask for hot water. Got hassled at the front desk about payment. Only $160 for 3 adults with 2 full sized bed fr 3 nights. I recommend booking your entire stay on line asI decided to stay an extra day even though there empty rooms they charged double for that day. the hotel is beach front located, is clean and the service is good, but you can't call this one a five star hotel. the neighborhood is very noisy, the bars around the hotel don''t close until 5 a.m. so unless you want to party at night and sleep during the day, or that you can sleep despite the noise, i cant not recommend this hotel. We had a great time at Hotel Costa del Mar. The front desk lady was very courteous, and attended to all our needs (internet, beach towels, etc) I would definitely come back and stay there again. The only things I might recommend would be an ice machine, and expanding the wireless internet coverage to include the rooms, so we don't have to walk over to the front office to access. Traigo aún dolor en mi cuerpo de los resortes encajados del colchón. Hotel centrico de todo el ambiente nocturno, hotel con salida a la playa. Si vous voulez faire la fête c'est parfait ! !